This is the photo off the cover of the CD "Jelani Eddington in Concert. This 3 manual, 27 rank Kimball/Wurlitzer represents many, many years of hard work and devotion. Over the years, the instrument has undergone a spectacular metamorphosis, from a small, rather bland instrument, to the lush and beautiful organ that it is today. 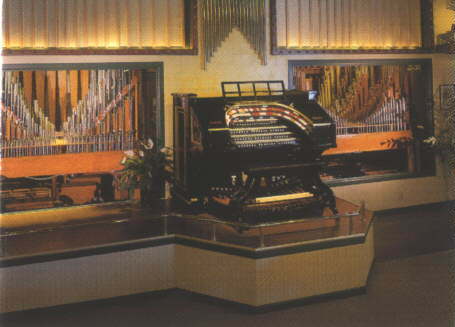 When the Organ Piper Music Palace opened in 1976, the featured organ was a 26-rank Moller that was in actuality not a true theatre organ. Unfortunately, since much of the pipework had been mishandled over the years, much of it simply ended up in the trash. However, during the first few years of Gary Hanson's ownership of the Organ Piper Music Palace, many exciting changes started to take place. After the decision was made to replace the Moller, the organ was dismantled and rebuilt one chamber at a time- while continuing to maintain the restaurant's normal performance schedule! Wurlitzer windchests, regulators and tremulants, along with choice Kimball and Wurlitzer pipework, replaced the Moller. Since that time, Gary Hanson has remarkably transformed the instrument into the captivating, colorful 27 rank theatre organ that it is today.